There is more information available on this subject at Mass driver on the English Wikipedia. The mass driver is a United Nations Space Command weapons system and orbital launch assembly. The operating principle of the mass driver is essentially the same as that of the Magnetic Accelerator Cannon: a coilgun that magnetically accelerates a package consisting of a magnetizable holder containing a payload. A mass driver, or "electromagnetic catapult", is a space-launch method that uses a linear motor to accelerate payloads to extremely high speeds. All existing and contemplated mass drivers use coils of wire energized by electricity to make electromagnets. Sequential firing of a row of electromagnets accelerates the payload along a path. After leaving the barrel, the payload continues to travel due to inertia. Once the payload has been accelerated, the two separate, and the holder is slowed and cycled for another payload. Mass drivers consist of flexible "gimbal" assemblies that are linked with magnetic induction devices. They can be loaded with payloads of limited weight, and by means of magnetic induction, mass drivers can propel low-weight payloads into orbit, i.e. easy disposal of hazardous nuclear waste. Mass drivers were used in developing colonies such as Harvest for orbital lifting, but their capacity for loads of limited mass eventually forced colony worlds to resort to more robust mechanisms for lifting. 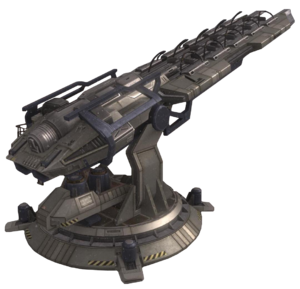 The magnetic induction technology of the mass driver was later applied to a whole field of magnetically operated UNSC projectile weaponry, such as the Magnetic Accelerator Cannon and the M68 Asynchronous Linear-Induction Motor. A ground-based mass driver station on Concord. Note the device's closer resemblance to a railgun than to a coilgun. The mass driver on Harvest was originally used for firing nuclear waste into Epsilon Indi, Harvest's sun, and also used during solstice celebrations on Harvest. Additionally, it could be used as an impromptu weapon, as demonstrated in the First Battle of Harvest; its magnetic induction technology could be used to propel projectiles at extremely high speeds with a high degree of accuracy, even going so far as to disable the Covenant ship Rapid Conversion in two well-placed shots. Later in the battle, the UNSC Planetary Security Intelligence Loki used a mass driver to destroy Harvest's orbital facility, the Tiara. Sometime after the colonization of Harvest, the shipping operations AI Sif had a critical failure in her data center's power supply. Trying to be as helpful as possible, another AI, Mack, used the mass driver to boost the component into orbit - literally shooting the power supply into the Tiara's coupling station. This was a very risky move, seeing as Mack could have easily destroyed Sif's main data center, effectively "killing" her. Longbow Station in the northern polar region of Concord had a number of channel-based mass drivers, used by the Unified Earth Government to deliver deep-space monitoring relays to study remote star systems before the Human-Covenant War. At least one of Concord's mass drivers appeared to be based on railgun technology, as opposed to the coilgun technology used by other known mass drivers. The Rubble possessed two mass drivers which were used to break up larger asteroids to make mining them easier. 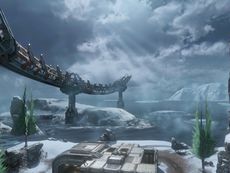 They were later used to disable the UNSC Midsummer Night, but were later destroyed by the Covenant ship Infinite Spoils. During the Siege of New Alexandria in the Fall of Reach, the city's mass driver was used to unsuccessfully stop an approaching SDV-class heavy corvette within "danger close" range. On the last day of the invasion, Emile-A239 manned a Mark 2488 Onager mass driver to fend off Covenant forces assaulting the UNSC Pillar of Autumn at the Aszod ship breaking yards. However, Emile was killed by two Sangheili warriors, prompting SPARTAN-B312 to commandeer the cannon and destroy an incoming CCS-class battlecruiser in order to allow the Autumn to escape. During the Raid on Ivanoff Station in the summer of 2557, several mass drivers were used to defend the Composer from invading Covenant remnant forces under the auspices of the Didact and his ship, the Mantle's Approach. Ultimately, they failed to prevent him from acquiring the Composer. The Onager installed in the Aszod ship breaking yards. A mass driver's magnetic coils charging. SPARTAN-B312 firing a mass driver at an incoming CCS-class battlecruiser.